I just finished reading Designing Your Life: How to Build a Well-Lived, Joyful Life, by Bill Burnett and Dave Evans. Bill and Dave run the Product Design Program at Stanford. They teach a Designing Your Life course that applies the principles and techniques of Design Thinking to the way we discover and plan our lives. The book is more than self-help prose, encouraing you to be intential. Burnett and Evans believe that in order to achieve something, people need process — a design process — to help us figure out what we want and how to create it. It’s more than planning. In the same way that we should approach product design, life design requires a good amount of research and validation. The more quickly we can iterate in small batches through discovery and validation, the more quickly we can learn whether we’re heading in the right direction. The proposal is to prototype your life. Designers don’t think their way forward… designers build their way forward. Rather than dreaming up a lot of fun fantasies that have no relationship to the real world—or the real you—they show us how to build a future brick by brick, how to approach our own life design challenges with the same kind of curiosity and creativity that resulted in the creation of the lightbulb, the printing press, and the Internet as they give us the tools and show us certain simple “mind-sets,” and how to use them to practice life design in your life. While portions of the book were a little dry—I judge the quality of a book by how fast I finish it and how fast I finish is based on me not putting it down—I generally found it insightful. Interestingly though, with this book, it was when I wasn’t reading that I got the most value. Between reading sessions, I found myself reflecting on events that had occurred throughout the day. Similar to post mortum retrospectives we hold in software development, I learned a lot of things by looking back at my motivations and individual decisions I had made. If nothing else, the book was worth reading for that experience. The part of the book that I enjoyed the most though were the chapters on How Not to Get a Job and Designing Your Dream Job. It’s no surprise that trolling job boards day in and day out isn’t effective. Neither is peppering random business with your resume. That method, used by 90% of Americans to hunt for a job, has a success rate of only 5%. Only 20% of all jobs available are even posted on the internet. The entire process of posting jobs, collecting resumes, and searching databases for keywords by recruiters is incredibly inefficient and it’s working against you. Often, it’s even a charade. Internal recruiters I’ve worked with in the past haven’t liked me much because I wasn’t willing to play the game. I insisted on writing my own job descriptions and engaging with candidates directly. I only used their applicant tracking system when forced to, for the final step to officially complete the required paperwork. Why? Because that’s what works. Most job descriptions aren’t written by the hiring manager or someone who really understands the job. The job description almost never captures what the job actually requires for success. The authors cover the structure of most job postings, breaking them down into three parts: generic qualifications that are attributes of any good employee, rediculously detailed lists of very specific education requirements and skills, and then the “superhero” and “wishful thinking” qualifiers that should scare off and and disqualify everyone. What prompted me to write this article though was what they shared about how it should be. In a perfect world, job descriptions would speak to deeper issues about why we work or what work is for. Looking for candidates who would like to connect their Workview to their Lifeview. Looking for candidates who believe that good work is found through the proper exercise of their signature strengths. Looking for candidates with high integrity, the capacity to learn quickly, and high intrinsic motivation; we can teach you all the rest. That’s how I build teams: designing them. You’ll never find something you’re not looking for with specificity and unicorns don’t exist. Look for good clay to start with—you can teach the hard skills. Dream jobs rarely can be found, so stop looking. 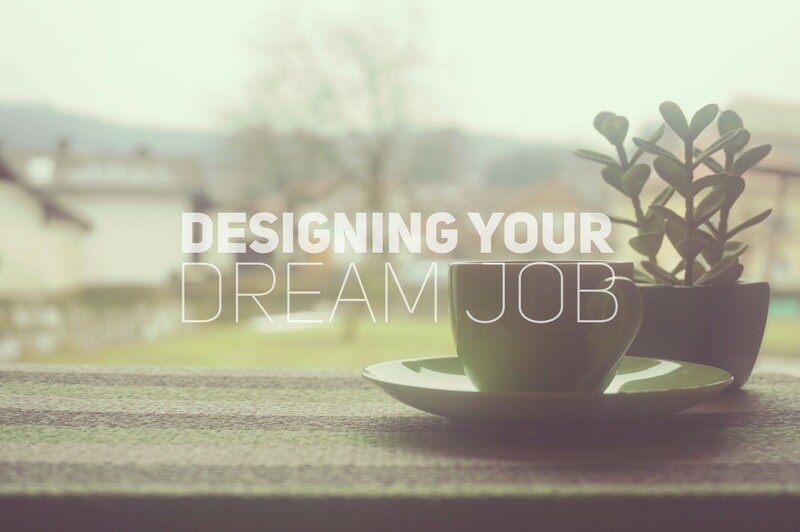 Dream jobs are designed. There’s a hidden job market that’s only open to people who are already connected into the web of professional releationships in which that job resides. It’s an insiders game and it isn’t won by those seeking jobs—it’s won by those seeking to learn—by the interested inquirer. This web of releationships is built on relationships and giving back. Start investing now. Volunteering, mentoring, lunches, job-shadowing are all really good ways to get to know people and organizations and to learn the culture and dynamics of an area or industry. Note that I didn’t say “networking.” Building up LinkedIn connections with people you’ve never met isn’t going to help. This is about relationships. Good, old-fashioned, shake-your-hand, kind of relationships. Instead of trying to find a job, start interviewing people you find genuinely interesting. Do it again and again. Set a goal to meet and interview a certain number of people per week or month. …learn about a particular kind of work or role to help you find out if you want, at a later date, to try and get a job doing that kind of work yourself. While conducting the conversation, you really are not after the job—you’re after the story. Stop looking and start designing. Approach it like a designer: form a hypothesis, do the research, and start prototyping. Be humble. Be patient. Ask. Listen. Learn. How does getting the story turn into getting a job? It’s simple: usually the person doing the talking does it for you.